. : Craig Storey :: Ski XCOttawa.ca :: Skiing in Ottawa and Gatineau Park :. If it wasn't for Craig, you wouldn't know about XC Ottawa. 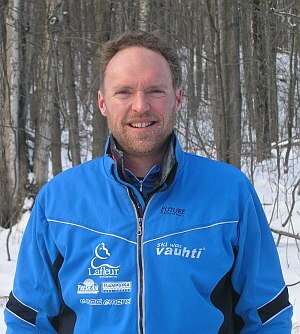 He is the brains behind our website and an excellent liaison within the Ottawa-Gatineau ski community. Craig has been skiing a long, long time and is focussed on training smart to remain injury-free. He had a tough 2007-2008 season with injuries which allowed him only to compete in skating events but he STILL managed to WIN the 2008 Gatineau Loppet 29km skate event, during which he rescued Megan from a near-bonk and helped her move up to finish 5th in the 53km skate. Craig is preparing to defend his Gatineau 29km skate title this year. Craig also takes a light interest in physics. When not training he spends time working at the NRC but we would have to kill you if we told you what he does there.